grandma's cookie jar: crafting with grandma - Summer Fun for Children's Day - Ice Chalk! crafting with grandma - Summer Fun for Children's Day - Ice Chalk! Yesterday was Mother's Day - I hope you all enjoyed celebrating this day with the people you love; my family, and extended family, got together at my mom's for four generations of family celebration! My personal highlight of the day was time spent with my children and grandchildren - Josiah and Caleb came to church with us and Josiah actually took real notes in church!!! I was so surprised to watch him sound out the words the pastor said which stood out to him and then write them on paper!!! Made my heart happy! At any rate, the next "family celebration" is on June 8, 2014 . . . Children's Day!!! So, if you would like to get a "jump start" on making some fun gifts which your grandchildren can enjoy, check this idea I found on Pinterest for Ice Chalk!!! 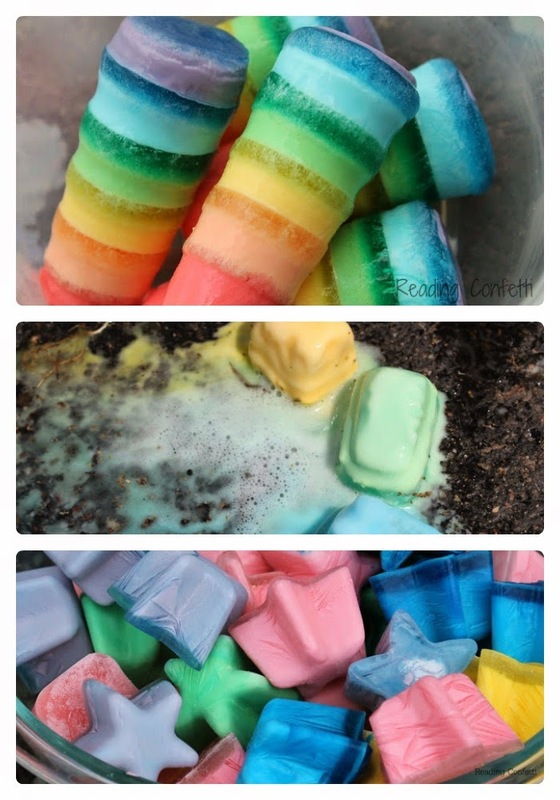 Follow this link and you'll find seven different recipes for making Ice Chalk - it would be fun to make with your grandchildren, or to surprise them with on Children's Day or throughout the Summer for some cool fun! I think my grandsons will especially enjoy adding baking soda to the recipe and then using vinegar to make their drawings "bubble"! Have you ever tried this? Do you think it is something you might add to your plans for Summertime fun this Summer? Enjoy!